Abstract. An observing system simulation experiment (OSSE) is presented in the Sea of Marmara. A high-resolution ocean circulation model (FESOM) and an ensemble data assimilation tool (DART) are coupled. The OSSE methodology is used to assess the possible impact of a FerryBox network in the eastern Sea of Marmara. A reference experiment without assimilation is performed. Then, synthetic temperature and salinity observations are assimilated along the track of the ferries in the second experiment. The results suggest that a FerryBox network in the Sea of Marmara has potential to improve the forecasts significantly. The salinity and temperature errors get smaller in the upper layer of the water column. The impact of the assimilation is negligible in the lower layer due to the strong stratification. The circulation in the Sea of Marmara, particularly the Bosphorus outflow, helps to propagate the error reduction towards the western basin where no assimilation is performed. Overall, the proposed FerryBox network can be a good start to designing an optimal sustained marine observing network in the Sea of Marmara for assimilation purposes. 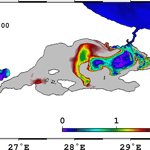 How to cite: Aydoğdu, A., Hoar, T. J., Vukicevic, T., Anderson, J. L., Pinardi, N., Karspeck, A., Hendricks, J., Collins, N., Macchia, F., and Özsoy, E.: OSSE for a sustainable marine observing network in the Sea of Marmara, Nonlin. Processes Geophys., 25, 537-551, https://doi.org/10.5194/npg-25-537-2018, 2018. This study presents, to our knowledge, the first data assimilation experiments in the Sea of Marmara. 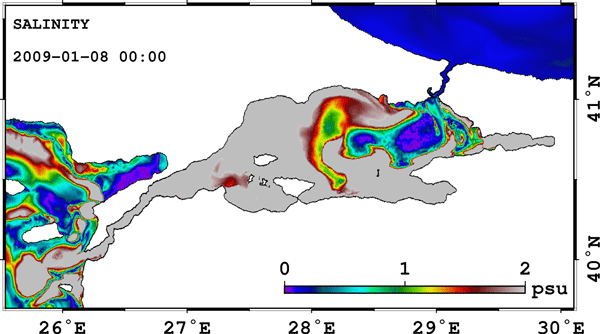 We propose a FerryBox network for monitoring the state of the sea and show that assimilation of the temperature and salinity improves the forecasts in the basin. The flow of the Bosphorus helps to propagate the error reduction. The study can be taken as a step towards a marine forecasting system in the Sea of Marmara that will help to improve the forecasts in the adjacent Black and Aegean seas.